7.88 points at 16 votes (rank 109). The Caliph of Damaron feels that his end is near and wants to hand over his regency over the kingdom to his son Harum. But he has not the possiblity to do this, as a spell turns the Caliph into a Falcon. If this spell is not broken within a limited time span, the Caliph will stay in this shape forever. Princess Sylphani calls for the only one that can accomplish this, Sinbad! You now take over Sinbad's part and do not only need to find out how you can rescue the Caliph, but also constantly keep the Prince and Princess under protection. You start your task with little knowledge about this mystery and little time. When the hourglass has run out the Caliph will stay a Falcon forever . . . Your ship, the Sabaralus, and the crew wait at the port. You can sail with her over the seas or stay on land to search the surroundings of Damaron for solutions. Keep your eyes out for the Shaman and the Gypsy, both can help you with the solution. There is also an alluring woman which has - amongst others - the ability to give you great strength ... if you pay the price for this. The biggest danger for you is the Black Prince. He follows you during your travels and will challenge you to a fight every time you meet him. Although the Caliph tries to push it aside, it is a fact that the Black Prince is one of his sons. This makes him a potential heir to the throne. In the knowledge that the Caliph will never appoint him his follower, he tries to eliminate the other claimants to come to power that way. If he succeeds in killing Princess Sylphani and her brother and if his troups capture Damaron, the Black Prince Camaral will be the next Caliph. In Damaron or in the vicinity, you find a woman that is know for her black magic. Libitina is a dangerous temptress that can be persuaded to give you information but it is also possible that she can tantalize you. Not that you would not like that.... but a fact is, that the strength that she can give you during this, err, encounter, will be very helpful when meeting the Black Prince. It is adviced to every beginner to use this advantage when making his first journey. The Shaman is one of the first persons that you need to find. Only he knows how the spell that holds the Caliph captive can be broken. The Shaman is a legendary person and many people do not believe his existence. Renowned for his ability to see everything and to know the unthinkable, the wise Shaman is also an alchemist. When you have found him, note his words and follow his warnings. And do not forget where you have found him. Already as a young boy you got to know Iris the Gypsy. Avoided due to her strange and mysterious deeds, Iris lives alone with the sufferings of her advanced age. She seldom finds someone with an open ear, the people are always too busy to spend time with a pathetic, old woman. But you took the time and visited her whenever you could. In the early days, you and Sylphani once received a mysterious crystal. Always being happy about seeing her old friend, she tells you astonishing stories from far away lands. Her knowledge can be an immeasurable help. But she will also serve up unbelievable things and you will need some endurance. Is able to help you out when you are in a tight corner. The genie will save your skin more than once until you have the abilities of a true adventurer. After having found him, he will see you as his master. If you lose him, then search for him, you will find him again. And note that the wishes that he offers you go after the circumstances, so in case something should go wrong, do not hesitate to ask him for help. 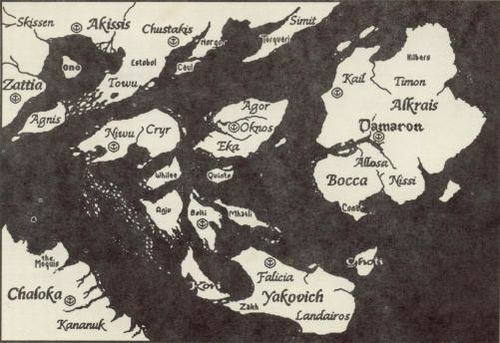 A long time ago in a far away past, a race named Ishtiki took possession of the land in the West. According to the legend, the Ishtiki worshipped three sisters as godesses. Only little is known about the practices of these forgotten religion but there are stories about sacrificing rituals that were carried out by archpriests to conjure up the power of the three sisters, to turn humans into creatures and back again. It is said that the Ishtiki owned three Idols, one for each sister, and that each statue contained great power that could only be released by sacrificing rituals involving certain creatures. Each of the statue is said to be owning eyes consisting of a pair of jewels and according to the legend, the power is supposed to go to each person that owns one eye of each statue. Gypsies tell a story about an adventurer that tried to gather these jewels - it ends with the opening of the Earth which then devoured him. . . The statues became a legend a long time ago but rumour has it that there are still people who know about the occult secrets of the Ishtiki. The aim of the game is to find four magical things that are randomly scattered around the kingdom to be able to turn the Caliph back into his original shape. But there are some people that want to avoid this. There is e.g. the renegade brother or the inscrutable former wife. The game is a mixture of many different genres. 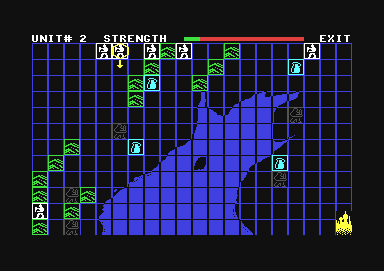 Through dialogues with other characters you get hints, in a strategy part you need to place the own armies correctly on a map to protect the palace from attacks, you sail over seas to reach different towns. In the intermediate sequences, Sinbad needs to survive an earthquake, fend off Pteranoxos (monster birds), fight agaings cylops, survive sword fights and rescue castaways. The map When the map appears, the current position of Sinbad is shown by a pulsing icon. Back with the fire button. Eyes - . . . Animal face - . . .
Genie bottle. This first needs to be found. Pull the joystick forwards/backwards to choose one of the three wishes or to make the genie simply disappear into its bottle. Confirm it with the fire button. The plundering forces of the Black Prince try to take over the city of Damaron. Sinbad needs to use the magic crystal to command the realm's army. If the forces reach Damaron, Sinbad is called back and needs to fight for life and death. To get to the war screen, click on the icon of the soldier in the crystal. As soon as the map appears you can see the strength of a unit and its movement commands by moving the yellow cursor over this unit. Sinbad's units are shown in white, the Black Prince's units are shown in black. To give a unit new commands for movement, press the fire button and keep it pressed and then pull the joystick into the desired moving direction. When the hostile units meet on a field, a fight starts that ends with the victory of the unit with the highest strength. Units that are in a fight are shown in red. There are supply centres that can fill up the strength of a unit. This is also for hostile units. Scattered over the map are the legendary Ishtiki Idols. If you encounter one of the statues, you need to move the cursor over one of the eye jewels and take it from its place. But be careful. . . The Black Prince uses these damned creatures as spies and Sinbad needs to shoot them with his crossbow, before they can report his position to his master. Move the joystick to aim and use the fire button to shoot. These evil creatures are man-eaters and utterly dangerous. To deal with them, move your slingshot left and right with your joystick. Press the fire button when you think that the position is correct. Also beware of the rocks. The Black Prince can use a spell that creates chasms. When the ground opens up, Sinbad has a limited amount of time to return to the Earth's surface. 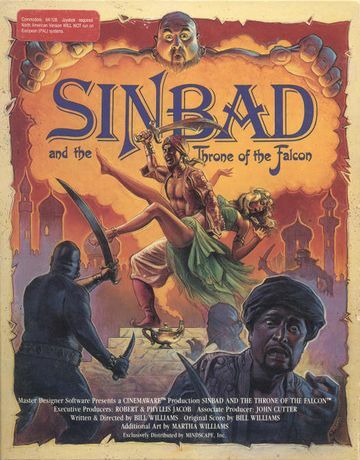 Move Sindbad with the joystick left/right. Watch out for dropping rocks. Press the fire button to jump to the next ledge or push the joystick forwards and press the fire button to jump one storey higher or climb onto a root. If you drop into the water do not let Sinbad drift out of the screen, push the joystick forwards to get the the lowest platform again. Sinbad will encounter many dangerous enemies on his travels. Move the joystick left/right to swing the sword. Block your enemies by pulling the joystick only into the direction from which the enemy wants to hit you. Try an attack by additionally pressing the fire button. Look for the power bar at the upper rim of the screen. You can also retreat by pulling the joystick towards you until the sword disappears at the lower border of the screen. During Sinbad's journey on the sea, he will get into storms that have made other ships overturn. If you discover a wreck, steer the Sabarulus with the joystick. Avoid the rocks. Look out for people drowning in the water. Men that you have saved will be added to your crew. To talk to a person you need to first click on him/her. The map can be called up on the ship by clicking the map scroll at the right and on land by clicking on the white scroll at the trouser waistband. Only use the genie as a last insurance. Look at the fight map. The blue marked fields are supply centres. Secure those. Human enemies: attack low and middle, not high. Animals: Fend off and attack high and partially middle. Idols: Defense and attack low (without the Gypsy's spell you have no chance). Idols: When you are ready to go searching for the Idols then first go to the most difficult one (Libitina will inform you which one is the strongest). If the eye is green, then click on it. (If it is not green, the a fight will follow that can hardly be won). Castaways: Always have an eye on the men between the rocks. But be careful, if you hit a rock, then the game is over. If you really want to spoil the fun, here is the solution. H.T.W: "The game leaves behind an utterly ambivalent impression for me. 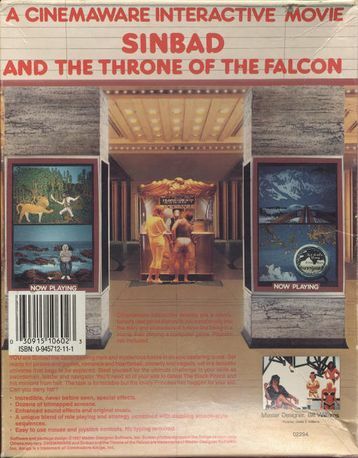 The presentation is perfect, it can instantly be seen that Cinemaware is the producer, the manual is atmospheric, the story is interesting and mysterious, the intro is very nicely staged, the background music fits perfectly, the graphics go from wonderful to not too bad. So what is there to criticise? Well, the implementation of the intermediate games was done differently. The graphics in the chasm is good but the animation a bit rigid, furthermore the rocks always appear exactly on the screen where you are at the moment. The games "Pteranoxos" and "Cyclops" pale. Very mediocre graphics and only aiming and shooting is a bit too little. The "Attack of the Birds and Snakes" is only a horizontally scrolling "jump-and-duck" game with dull graphics. The mini game at the Idols (only click on the eye when it is green) is also not the most imaginative one. The strategy part is relatively interesting and the idea to let the game sort of run in the background, so in real time, is good. The part with the castaways is mediocre, but I also have not found out what the new crew members are for. What makes the game interesting and makes it stand out from the crowd is the sequence of the single game parts, the conversations with the following aha moment and the overall aim. However, if you know the again very well done end sequence, there is no reason to repeat the game, as there is no score. Despite all the critic I need to admit, that I had lots of fun while playing through this (movie) game. Vote: Some weaknesses, but recommendable." Unfortunately, there is no highscore possible. This page was last modified on 3 December 2016, at 17:53. This page has been accessed 3,060 times.